Ramanuja Srinivasan M.A Professor Vidya Visarada Sangeetakala Sikhamani Natyasastra Kovida (born 21st academic career. He graduated from the presidency college. Madras in 1907 first class first in mathematics winning the pitti Munnuswamy chetty gold medal and the marsh prize and passed the M.A first class first winning the Stuart Prize. Entering the maharaja’s college. Trivandrum in 1910 as assistant professor of Mathematics he retired as its principal in 1942 from 1943 he was the director of the travancore broadcasting station. 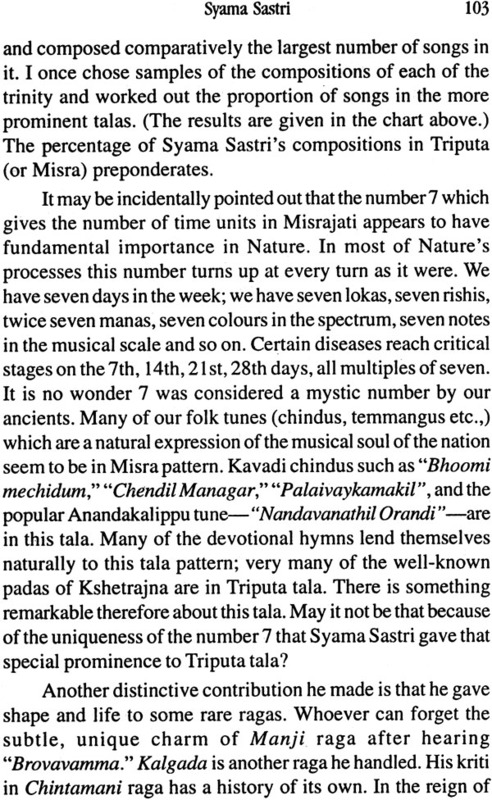 While mathematics met the mundane needs of the professor music had been his spiritual fibre. 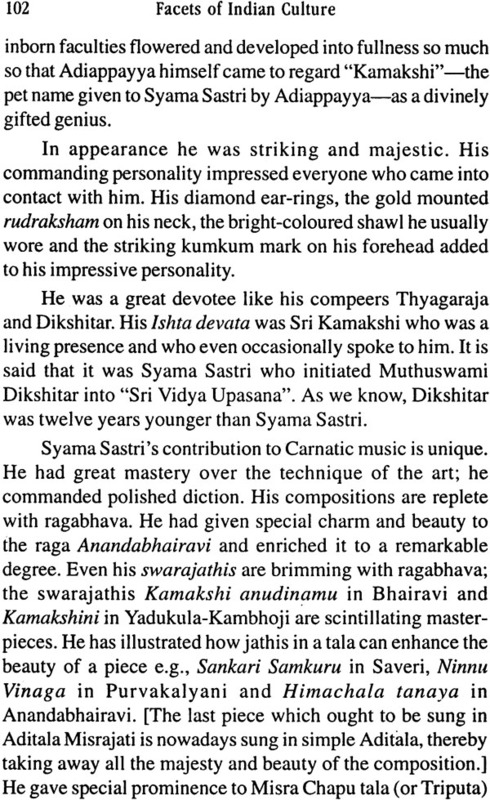 A gifted Harikatha performer he had always been active in innumerable expert committees on music in travancore and madras. 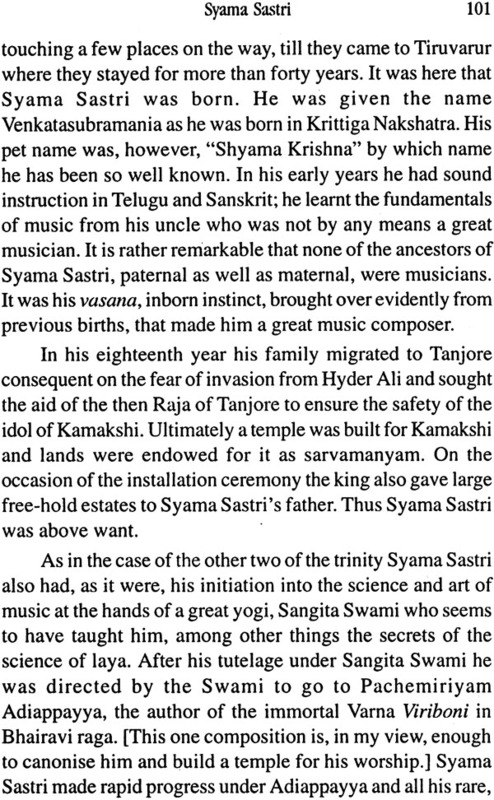 He was for several years a member of the central advisory board for music in the government of India. He was twice invited by the Sri Lanka Government to advise them on the programme side of their broadcasting system. 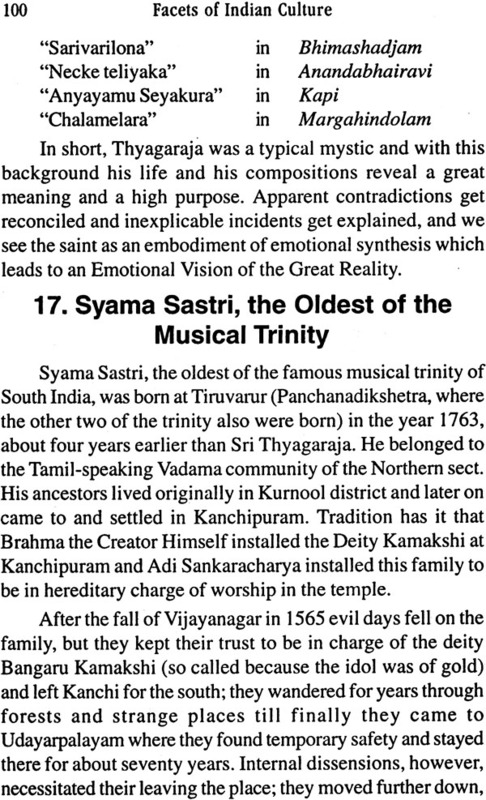 He did valuable research and composed pieces in some of the rare ragas of the Kalashetra Adayar a popular writer and lecturer in English and Tamil. Prof. Srinivasan had written two dramas in Tamil and Many articles in Tamil and English for various periodicals. This book contains of his speeches and writings which indicate the dimensions of his learning. 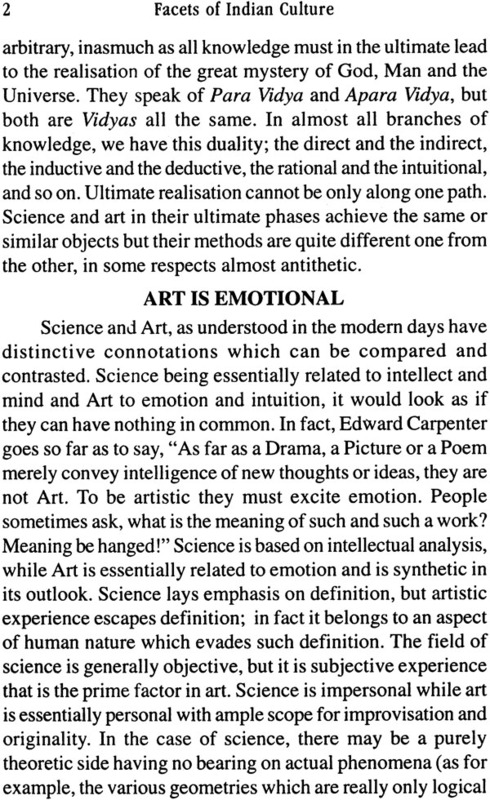 Professor R. Srinivasan is well known for his expert knowledge in several braches of Art. 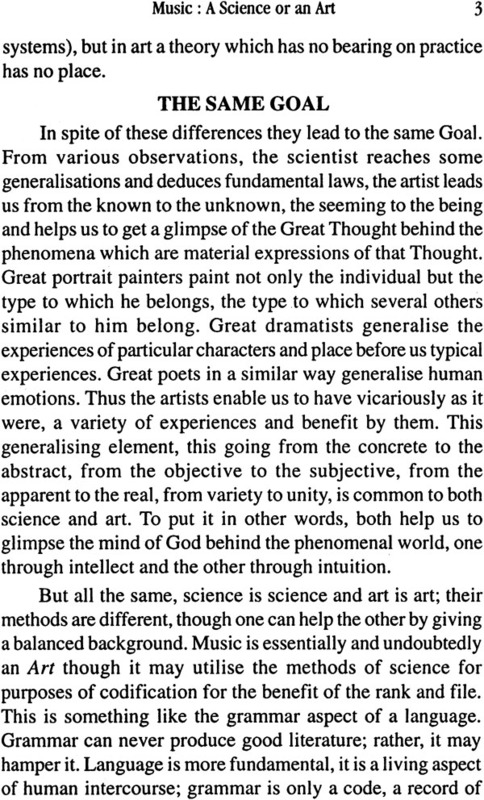 Science and philosophy. 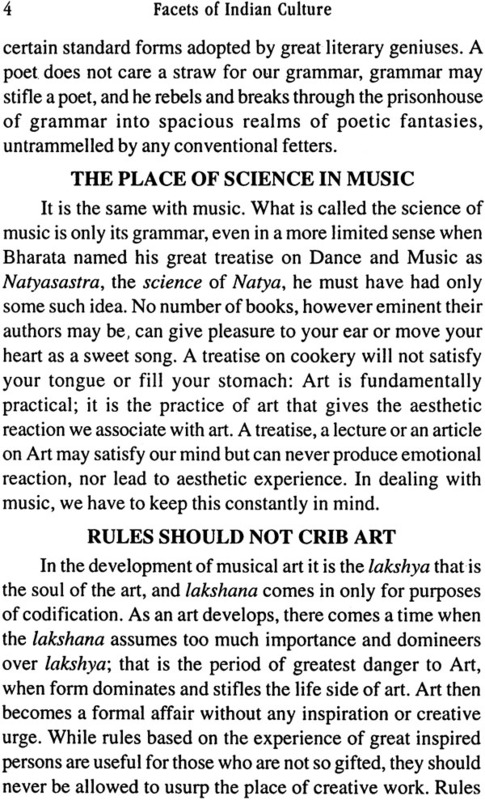 Whether he deals with the mathematical and acoustical aspects of music or insists on the cultural importance of musical education or on intuitive originality and improvisation whether he recounts the history of Natyakala and inveighs against its growing vulgarization whether he reviews the rituals and the mysticism attendant on the consecration and maintenance of temples or stresses that science is curiosity about life philosophy an attitude towards life art is a wonder of life and religion is reverence for life Professor Srinivasan is equally interesting and equally thorough. 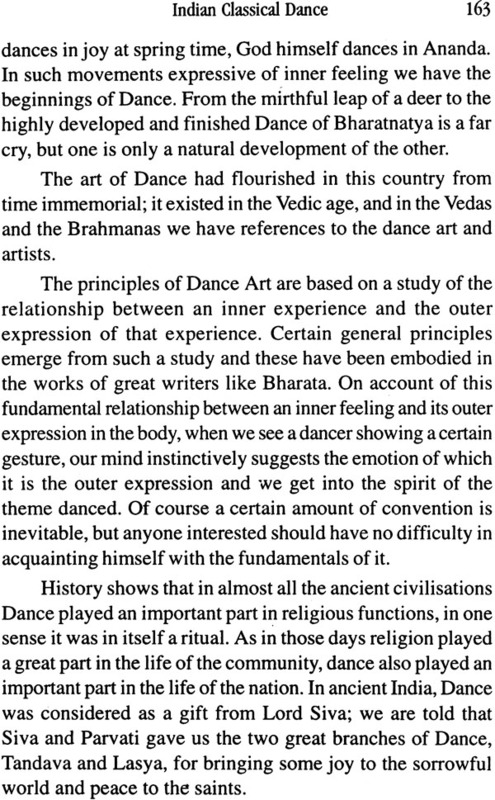 Dealing with Drama as a form of Yoga he remarks that the function of the dramatist is to give us typical experience of various types of humanity and that he enlarges thereby the significance of people and events. One of the most arresting of the papers which he is now collating for publication is that on the Nature and function of institution or Vigana. 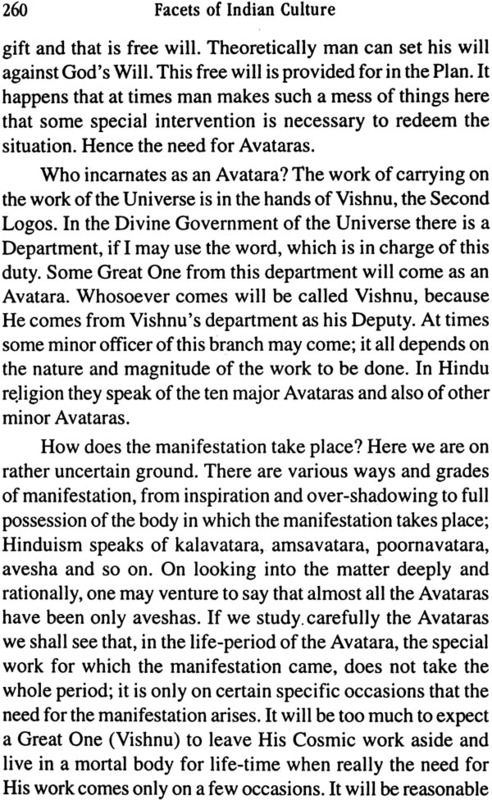 He outlines the significance of the several concepts termed respectively Manas, Buddhi, Gnana and Vignana. He hopes that humanity will develop a new faculty of intuition which will interpret the phenomena of the world in a new way. This in fact is exactly what is taking place in the higher reaches of science today and is demonstrated by the recent speculations of physicists and astronomers and remodeling of the older cosmology of the basis of relativity and the newer philosophy revolutionizing older ideas of space time matter and energy. 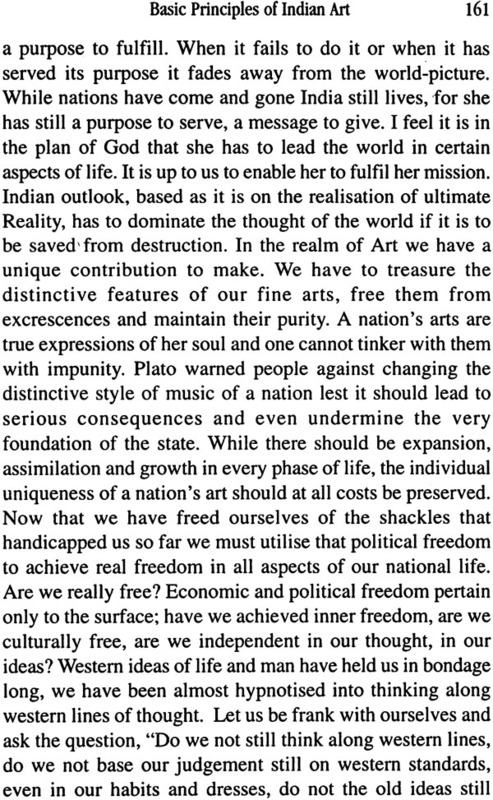 As an educationist of long experience Professor Srinivasan takes care to point out that disciplined freedom is alone the real freedom. 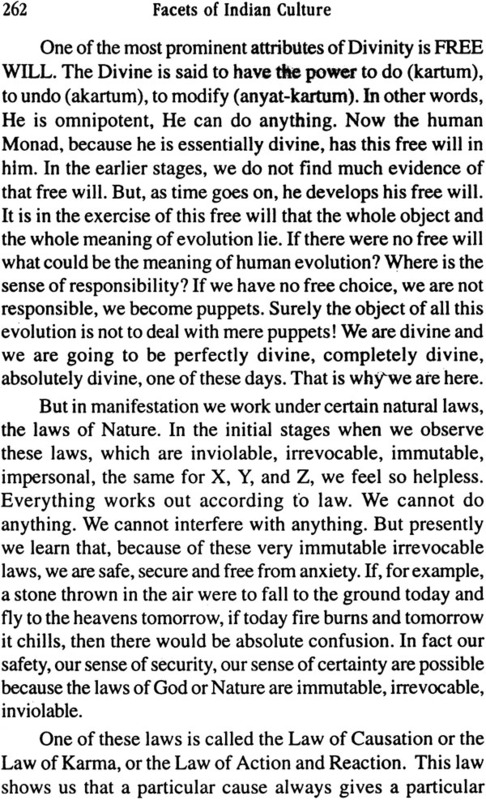 And in his paper on the gift of free will he dwells on the thesis that man is the creator of his own destiny and his own absolute law-giver. It is from this point of view that he deals with the problem of suffering. I was specially struck with his not on Some Languishing Arts including the puppet drama the Kolam and the Narvaratri Kolu. 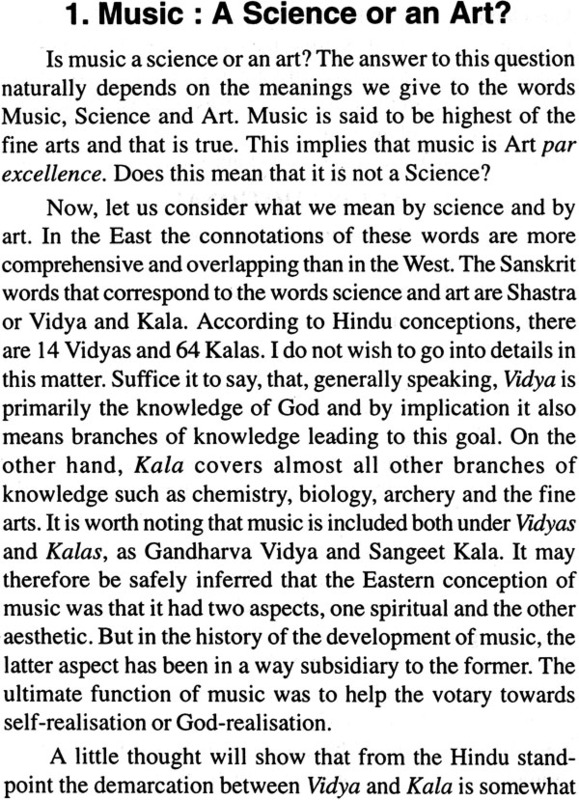 With a much needed candor the professor white indicating the importance of the Katha Kalakshepam adverts to the danger of the modern Katha becoming in his own language of hotch potch of indifferent music and low class humor. It is with great pleasure that I welcome the publication of the lectures and memoranda prepared during several years which professor Srinivasan is now collecting for the benefit of the public. All that he has written is refreshingly stimulating and often displays real originality. The articles extracts and memoranda contained in this volume are a selection made form out of a number of articles and other pieces contributed to various papers and journals on various occasion. 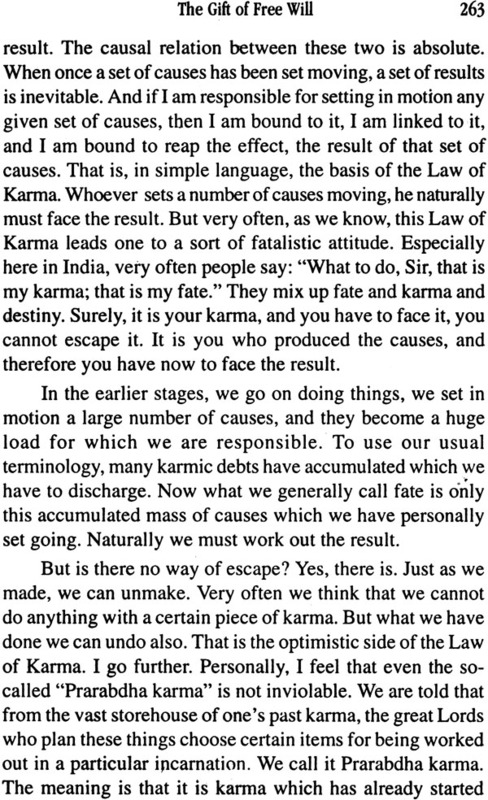 In the circumstances a certain amount of repetition is inevitable. But care has been taken to reduce overlapping to the minimum. 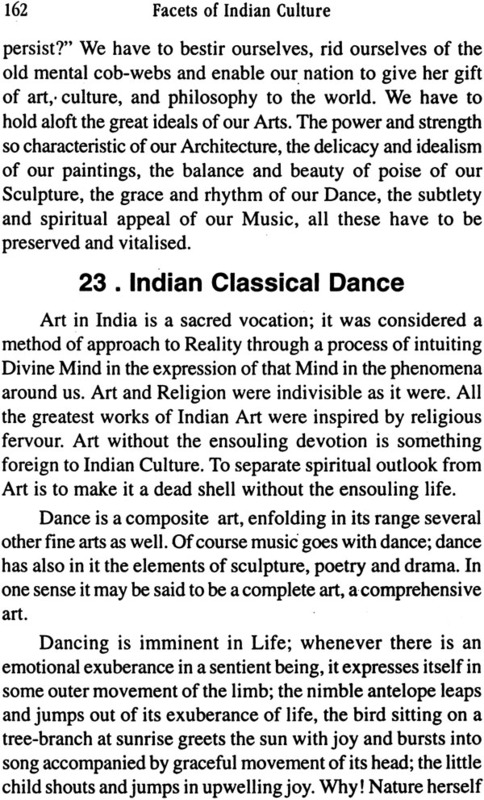 The articles will to some extent reveal my three great interests in life – what I call my three “M” s, Music mathematics and mysticism I have tried to understand the soul of India’s culture through these aspects: Art, Science, and Religion in its deepest and most universal sense. The greatness the uniqueness of Indian outlook lies in the value it sets on higher things, things relating to the soul. It does not however neglect material concerns it has made headway even in those directions. But it has looked upon material comforts only as means to an end it has never allowed these concerns to overshadow the higher and the more permanent aspects of a human being. I cannot adequately express my gratitude to Sir. C.P. Ramaswami Aiyer for the exceedingly kind hearted foreword which he has written. He is true son of India and is gifted with a big hear I thank him most warmly for his kindness. My sincere thanks are also due in abundant measure to Sir S. Radhakrishnan the philosopher politican who in the midst of his heavy and unceasing duties found time to go through my articles and write such kind words of appreciation. 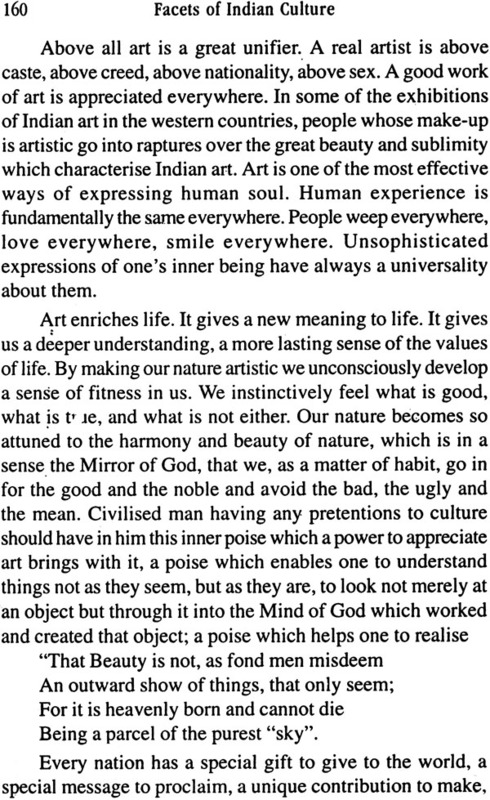 He is an apposite of India’s philosophy and culture. I feel greatly honored by his warm appreciation I am very grateful to him. What shall I say about the Bharatiya Vidya Bhavan which has come forward to publish the book? I am tongue-tied. It is only in keeping with their tradition to stand by and help to keep the old culture of India undimmed and guard it against unwholesome onslaughts. My heart felt gratitude goes to them in an unlimited measure.